What is it and should I get involved with this, only a hour away and listed for 600 I’d much rather pay like 200. Owner is going to try and find the tag, no word if it runs and produces power yet. At only 8 kW with a 2 cylinder engine, I suspect it is a 1800 RPM generator, and not a 3600 RPM "screamer." That's a definite plus! Wisconsin engines are good, heavy duty industrial engines. They will last forever with proper care. If it hasn't been run in a while, there is a seal on the oil pump that should be checked. Someone else on this board may chime in to tell you what to look for. Unfortuntely, I don't know. For its age, the generator set appears to be in good condition. The orange color was Pincor's (Pioneer Gen-E-Motor) signature color. From the photo, it's hard to tell whether it's orange, red, or reddish orange. It may be a Pincor, or something else. Personally, I wouldn't be interested in it at $600, but it may be worth that to someone. $300-$400 would be my top offer, and that's only if it runs. 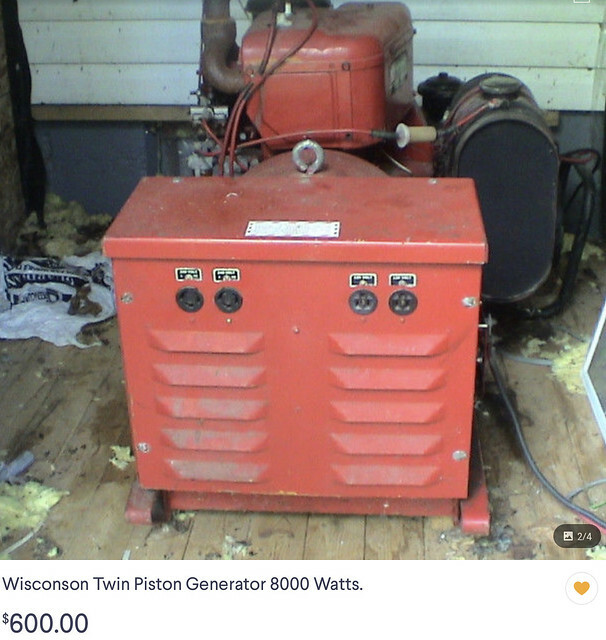 I understand that generators in Canada tend to be priced higher. Hello, It looks like its made by Win-power, if its 4 pole and 1800 RPM its more like 6000 watt, I had one about 20 years ago and it was a 6KW 120/240 V 1 PH . ok if you dont need portability because of weight. It was probably made in the 80s it pulls the AC power from the armature so you want to make sure the brushes are good and free in the holders if its been setting around. Looks like a WINPOWER GE6W4-C (single phase) or -D (three phase). 6KW, 120/240VAC, 1800 RPM. 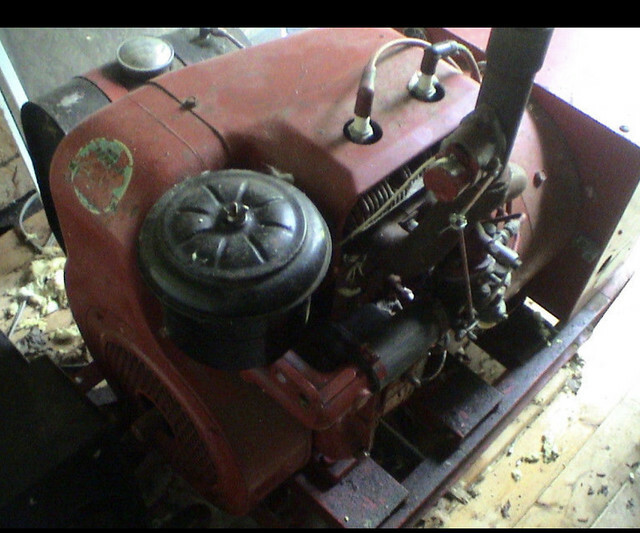 Wisconsin TJD engine, 11.7 HP at 1800RPM. About 575LBS. Data Sheet dated 9/15/1969. If that's an 1800 rpm unit it'd be worth a look. Those are great engines. There is a check ball in the oil pump that likes to stick. There is a metal line that runs to the governor; loosen it and turn the engine over to see if oil comes out. If it does, the ball is not stuck. Valves like to stick open too when they sit for a long time. Extremely reliable engine. I have one on a wood splitter and another on a 10kw Winco 2 pole screamer. You will need a generous fuel budget. They are THIRSTY. Can tell by the position of the pole shoe bolts in the second photo that it is indeed a four pole generator. All times are GMT -4. The time now is 12:23:34 PM.